The Eighth Amendment to the United States Constitution prohibits cruel and unusual punishment at the hands of the government. Despite this proscription, America is quite possibly the most punitive nation on earth. With incarceration rates that rival Stalin's, prisons that are overcrowded and violent, and with a healthy distaste for compassion and forgiveness, the United States is an exceptionally cruel nation. This is not news. The scholarship devoted to exposing and exploring the merciless criminal justice system in this country is abundant. But there has been a piece missing from the critical discourse on the subject of criminal justice and incarceration: How does the United States compare to other modern, long-established democracies with respect to crime and punishment? 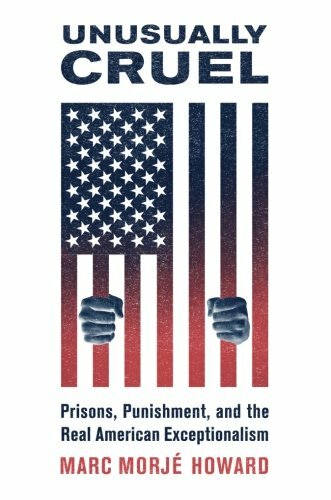 Professor Marc Morjé Howard of Georgetown University provides an excellent comparative analysis of modern criminal justice in his book Unusually Cruel: Prisons, Punishment, and the Real American Exceptionalism. Using France, Germany, and the United Kingdom, Howard breaks the "life cycle of crime" into six categories and compares the three European countries to the United States. The result of the analysis confirms that America is truly exceptional when it comes to criminal justice. Exceptionally brutal, inhumane and punitive. The first segment of the system analyzed by Howard is the plea bargain process. Theoretically, plea bargaining is a good idea. It is a negotiation between rational parties that takes place on a level playing field. The result is a "bargain" that everyone is happy with. Of course, this is not how American plea bargaining works in practice. Prosecutors are amazingly powerful forces, and public defenders are buried in clients. Plea bargaining is coercive, unfair, and subject to highly irrational decisions by defendants. Perhaps for these reasons, plea bargains are a rarity in France and Germany. In France, it is a relatively new concept and is resisted by all sides. Germany's merciful criminal justice system doesn't even allow plea bargaining except for minor crimes. The United Kingdom is an outlier here, with a robust plea bargaining system. But even the U.K. doesn't compare to America. British prosecutors are much less powerful than their American counterparts. With less pressure to obtain convictions, plea bargains in the U.K. are closer to the ideal. The second segment considered by Howard is sentencing. Simply put, criminal sentences in America are much longer than any European counterpart. In Germany, for instance, only six percent of those convicted of a crime serve time in a jail or prison. In America, 70 percent do, and for much longer terms than almost anywhere else. Natural life sentences are almost unheard of in Europe but are relatively commonplace in the United States. Why? According to Howard, the "tough on crime" crusade that has overtaken the U.S. criminal justice system is partly to blame. Determinate/structured sentences are the norm in most American jurisdictions, and the movement has been toward elimination of good time and imposition of mandatory minimums and maximums. The shift toward a tough on crime approach in American criminal jurisprudence is also at least partially to blame for the disparity in conditions of confinement, the third segment examined by Howard. The disparity is significant, with American prisons deemed to be "some of the harshest and scariest places in the democratic world." According to Howard, the two main features of American prisons are overcrowding and violence. The reasons for this are complex, but deserve to be thoroughly explored. One frequently cited explanation for the heinous conditions in American prisons is what is known by sociologists as "legal endogenity." This is when courts, the only overseers of American prisons, mandate minimum standards that prison officials then recast as maximum privileges. Because courts give great deference to prison officials, minimum standards of human decency end up being all that a prisoner can ever expect. Prison conditions in Europe are significantly different. Health care is better, staff/inmate ratios are higher, and the relationship between staff and inmates is less antagonistic. This is because European countries generally mandate the loss of liberty associated with incarceration to be the only punishment for a crime in which a prison sentence is imposed. This is not the case in America, where prison officials such as Joe Arpaio, former Sheriff of Maricopa County, Arizona, take perverse pleasure in demeaning and mistreating prisoners. Closely related to the question of how to treat prisoners is the issue of rehabilitation. Does it work? Should resources be devoted to trying to better prisoners, or should they simply be stored in base warehouses? In America, the concept of rehabilitation has been almost completely vanquished from the prison setting. If we are to be tough on crime, prisoners should not be coddled with rehabilitative programming. And the most famous study on the efficacy of rehabilitation, the so-called Martinson Report, has been oft-cited as evidence that "nothing works" when it comes to rehabilitation. There's one problem with the "nothing works" concept, though. It's dead wrong. Recidivism rates, the most used measure of what does work, are notoriously difficult to measure. But rehabilitation does work. And while there is no evidence of a connection between the "nothing works" report and the death of rehabilitation in America, the author, Robert Martinson, killed himself by jumping from a window. Rehabilitation is a major focus of the criminal justice system in Europe. In fact, rehabilitation is constitutionally guaranteed in Germany. In the countries examined by Howard, judges and prison officials stay heavily involved in the process of prisoner rehabilitation. Prisoners are seen as citizens who will return to the population, not as widgets to be warehoused and forgotten. Parole and reentry are the final two segments of the "life cycle of crime" analyzed and compared by Howard. Parole has all but disappeared in the United States, but is a robust part of the criminal justice systems in France, Germany and the United Kingdom. And according to Howard, reentry is the area of criminal justice with "perhaps the most egregious discrepancy of all." In America, felons wear a scarlet letter. Ex-prisoners often cannot vote, cannot find a job, and cannot find housing. In the three European countries, however, significant efforts are undertaken to limit the collateral consequences of imprisonment. Felons do not lose their right to vote, criminal records are less accessible to the public, and discrimination on the basis of criminal record is in some cases prohibited. Why is America so different than other modern democracies when it comes to criminal justice? According to Howard, there are four reasons: Race, religion, politics, and business. As a nation, America has struggled with racial inequality since its founding. Despite the idea of separation of church and state, much of American criminal justice practice is informed by the Biblical mandate of "an eye for an eye." The debate on criminal justice is dominated, politically, by a "a tough on crime" rhetoric. And the United States is one of very few nations on earth that allows profit to drive criminal justice policy and practice. Howard's rigorous comparative analysis of American and European criminal justice systems is eye opening and thought provoking. The disparity between these modern systems raises serious questions about what kind of people we are and what kind of society we want to be. Toward the end of the book, Howard poses a question that every American must consider: "How would we want our friends, family members, and even ourselves to experience the punishment for a terrible mistake?" The answer to that question should inform our criminal justice policy.